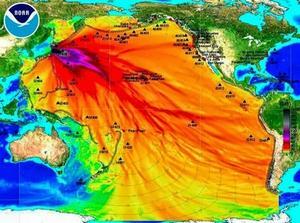 On the third anniversary of the Fukushima nuclear plant incident, scientists are reporting that low levels of radiation from the Fukushima plant will reach ocean waters along the U.S. West Coast by April 2014. The scientists say that the radiation will be at levels too low to harm humans, but they call for more monitoring, including at the federal level. On the third anniversary of the Fukushima nuclear plant incident, scientists are reporting that low levels of radiation from the Fukushima plant will reach ocean waters along the U.S. West Coast by April 2014. Ken Buesseler, a chemical oceanographer at the Woods Hole Oceanographic Institution, says that current models predict that the radiation will be at levels too low to harm humans, but he called for more monitoring including at the federal level. In July 2013 the Tokyo Electric Power Company, which operates the Fukushima Daiichi nuclear power plant, reported that contaminated water stored underground leaked into the ocean. Scientists have developed three competing models of the Fukushima radiation plume, proposing different arrival times at the West Coast and different levels of radiation, but all models predict that the plume will reach the West Coast this summer, or as early as April. A report presented last week at a conference of the American Geophysical Union’s Ocean Sciences Section said that Cesium 134 has already arrived in Canada, around the Gulf of Alaska. Buesseler notes that Cesium 134 serves as the fingerprint for Fukushima. “The models show it will reach north of Seattle first, then move down the coast,” Buesseler said. Washington State does not test its waters for radiation. Models predict that Cesium 134 will be diluted in the ocean by the time it reaches the California’s coast. Cesium 134 has a half-life of two years, meaning it takes two years to break down into a more stable material. California regularly tests seawater around its nuclear power plants to check whether the plants are endangering the environment, but those results show minimum detectable activity. Since April 2012, Oregon state park rangers have been analyzing samples of surf water and sand for Cesium 137 and iodine 131 at three coastal locations. Both already exist in the ocean at low levels from past nuclear testing. To date, the analysis has shown only minimal detectable activity. Oregon Health Authority spokesman Jonathan Modie said the most recent samples taken in mid-February will be available in mid-March. Some scientists are sampling the West Coast seawater without government support. Cal State Long Beach marine biologist Steven Manley launched Kelp Watch 2014 to monitor kelp along the West Coast for Fukushima radiation. Buesseler’s project titled How Radioactive is Our Ocean? will use crowd-sourced funding and volunteers to test water samples along the Pacific Coast.